President of the faculty of the Jewish Theological Seminary of America; formerly reader in rabbinics at Cambridge University; born in Rumania in 1847. His youth was devoted exclusively to the study of rabbinical literature. He then went to Vienna, where he studied Jewish theology in the bet ha-midrash under Weiss and Friedmann, and attended lectures on philosophy and other secular branches of learning in the University of Vienna. After receiving his rabbinical diploma from Weiss, he continued his secular and theological studies in the University of Berlin, and attended Talmudical lectures by Dr. Israel Lewy. In 1882 Schechter went to England as tutor in rabbinics to Claude G. Montefiore. In 1885 he published his first essay, "The Study of the Talmud," in the "Westminster Review." In 1887 appeared his edition of "Abot de-Rabbi Natan," and he then wrote various essays and lectures in the "Jewish Chronicle," "Jewish Quarterly Review," "Revue des Etudes Juives," and "Monatsschrift." 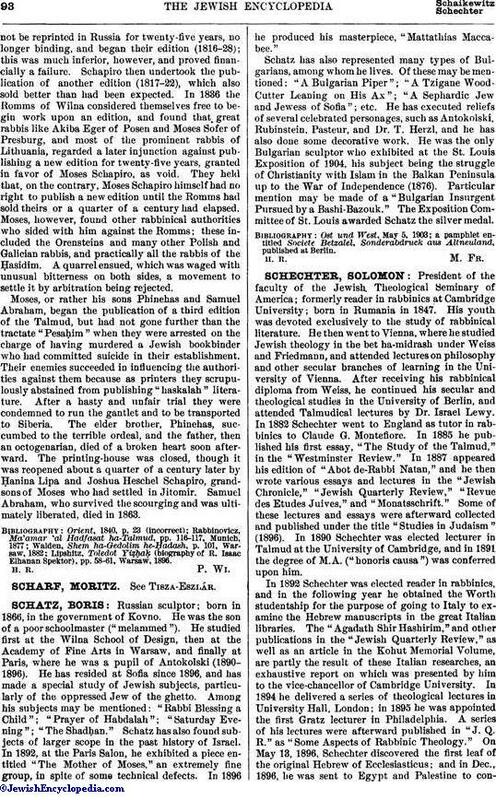 Some of these lectures and essays were afterward collected and published under the title "Studies in Judaism" (1896). 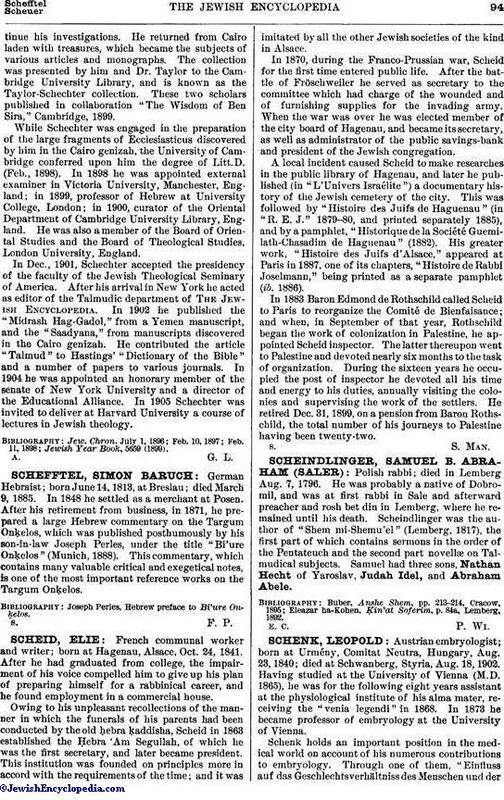 In 1890 Schechter was elected lecturer in Talmud at the University of Cambridge, and in 1891 the degree of M.A. ("honoris causa") was conferred upon him. In 1892 Schechter was elected reader in rabbinics, and in the following year he obtained the Worth studentship for the purpose of going to Italy to examine the Hebrew manuscripts in the great Italian libraries. The "Agadath Shir Hashirim," and other publications in the "Jewish Quarterly Review," as well as an article in the Kohut Memorial Volume, are partly the result of these Italian researches, an exhaustive report on which was presented by him to the vice-chancellor of Cambridge University. In 1894 he delivered a series of theological lectures in University Hall, London; in 1895 he was appointed the first Gratz lecturer in Philadelphia. A series of his lectures were afterward published in "J. Q. R." as "Some Aspects of Rabbinic Theology." On May 13, 1896, Schechter discovered the first leaf of the original Hebrew of Ecclesiasticus; and in Dec., 1896, he was sent to Egypt and Palestine to continuehis investigations. He returned from Cairo laden with treasures, which became the subjects of various articles and monographs. The collection was presented by him and Dr. Taylor to the Cambridge University Library, and is known as the Taylor-Schechter collection. These two scholars published in collaboration "The Wisdom of Ben Sira," Cambridge, 1899. While Schechter was engaged in the preparation of the large fragments of Ecclesiasticus discovered by him in the Cairo genizah, the University of Cambridge conferred upon him the degree of Litt.D. (Feb., 1898). In 1898 he was appointed external examiner in Victoria University, Manchester, England; in 1899, professor of Hebrew at University College, London; in 1900, curator of the Oriental Department of Cambridge University Library, England. He was also a member of the Board of Oriental Studies and the Board of Theological Studies, London University, England. In Dec., 1901, Schechter accepted the presidency of the faculty of the Jewish Theological Seminary of America. After his arrival in New York he acted as editor of the Talmudic department of The Jewish Encyclopedia. In 1902 he published the "Midrash Hag-Gadol," from a Yemen manuscript, and the "Saadyana," from manuscripts discovered in the Cairo genizah. He contributed the article "Talmud" to Hastings' "Dictionary of the Bible" and a number of papers to various journals. In 1904 he was appointed an honorary member of the senate of New York University and a director of the Educational Alliance. In 1905 Schechter was invited to deliver at Harvard University a course of lectures in Jewish theology. Jewish Year Book, 5659 (1899).